07 September 2007 (Thanh Nien News) – A cache of 16th-18th century Chinese coins buried in a jar was unearthed in the Quang Tri Province. The museum of central Quang Tri province has acquired a jar containing Chinese ancient coins which was found by a group of local residents. 15 Sep 2006 (VietNam Net Bridge) – A short news story on two cowry shell finds in the Bat Cave (no, not that one) in Quang Tri province. According to the article, cowry shells have been recognised as currency between 2,500 and 5,000 years ago. Archaeologists from the Viet Nam Institute of Archaeology and the Quang Tri Province Museum have unearthed two ancient cowry shells during an excavation at the Bat Cave in Quang Tri Province. Vietnamese researchers, studying a grotto discovered a decade ago in which Paleolithic period tools were found, a few days ago stumbled upon another nearby also containing ancient tools. Experts from the Vietnam Archaeology Institute and the Quang Tri Museum in central Vietnam were researching the Hang Doi (bat) cave in Cam Lo districtâ€™s Dragon mountain when they found â€œHang Doi 2â€. 15 July 2006 (VietNam Net Bridge) -Reports of an ongoing excavation belonging to a prehistoric culture. 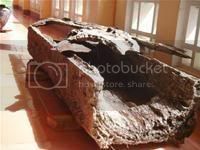 Archeologists from the Quang Tri Museum and the Viet Nam Institute of Archeology have unearthed hundreds of artifacts believed to belong to the early Hoa Binh culture dating back to about 15,000-20,000 years ago at an excavation site in central Quang Tri Province.